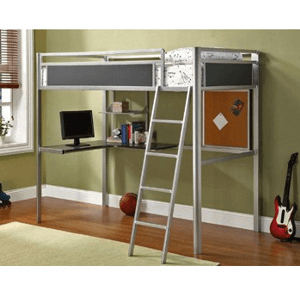 The Alexa Twin Metal Constructed Bunk Bed w/ Workstation is incredibly sleek, space efficient and perfect for adding style to a young childs room. Finished in stylish silver and gray, this bed features guard rails and a sturdy integrated ladder for maximum support. A workstation on the bottom allows the child a studious environment for getting homework done, while a comfortable bed provides a good nights rest. This metal loft bed with work station embraces both trend and functionality.